Creating and Managing Firefox Profiles Creating and Managing Firefox Profiles – MillionClues! I have a habit of saving my not-so-important passwords within Firefox, like the social networking passwords, temporary email passwords and the like. Also, I never log-out of my mail accounts until the end of the day, so when my sister comes in to check her mail, gmail loads into my email id. When I attended BarCampKerala this time I realized that there are profiles in Firefox too. But you won’t find them, until someone tells you about it. That’s why I decided to be that ‘someone’ to tell you How to create Profiles in Firefox. A profile is a collection of all your personal settings grouped under one name. If you are used with Opera, you know this well. Each profile can be considered as a separate browser, because each profile has its own settings, cache, saved passwords and even plugins. Why do you need different profiles? You need a profile if you need to keep your personal accounts separate from your official account, or if you share your computer with your family and you don’t want to share all your bookmarks and passwords with them. And if you are a plugin developer or a theme developer you would already have profiles and would not be reading this. Step 1: Close all Firefox windows. Step 2: Open the Run command box (Start > Run or Windows Key + R) and type in firefox –ProfileManager and press ok. Step 4: Make sure that the Tick Box ‘Don’t ask at startup’ is unchecked. You are done. 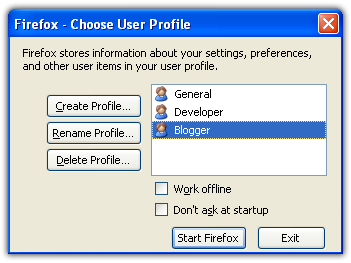 Now each time you start firefox, the profile manager will come up and you can select the profile that you want. You can edit and delete profiles too. You can assign a separate shortcut for each profile and start the corresponding profile without the Profile Manager window. Follow two steps. Step 1: Make a copy of the default Firefox Shortcut. Step 2: To the target session add -P “Profile Name” so that the Target reads somewhat like “H:\Program Files\Mozilla Firefox\firefox.exe” -P “Developer” where Developer is the name given to a profile (see screenshot too). If you have many sessions, create as many icons as you need and repeat the same. I found this information from Born Geek where he has got a lot more Firefox tutorials and Extensions. You can also find detailed information on profile creation with screen-shots on Born Geek. Do check them out. You can also read the Firefox help on managing profiles. Tell me if you already knew of this technique. If you had been already using Firefox profiles, tell me why you were using that for. I was wondering, why I didn’t know this until now, I had been using Firefox for the past 4 years. yes, i’m aware that we can create different profiles on FF. but i don’t really use it since i don’t share my PC with others..as simple as that. and if there’s anyone that want to use my PC, they can use IE or Opera browser in my computer ! Thanks for that, me too have IE, Opera, Chrome and Safari. But everyone in my family favours Firefox, maybe because I had been using it for a while and set it as my default browser. I didnt knew about Profile till yesterday. Why do Firefox hide that thing from the menu bars..? Any idea..? Maybe they want only geeks to use it.. right..? i’m not sure myself why FF don’t put it in the menu bars or something or even from the start menu. but the thing is i think is how the profiles were set up. you can’t change the profile after you open firefox, you need to close it first and open with different profile. although i think it’s more convenient to put the profile in the menu bars, and after we change to another profile, they can ask to close and restart the browser with a new profile. We are creating deferent profiles for deferent purpose, for example If you want to stumble or digg with toolbars you can create a separate profile named Blogger. For our personal internet usage like checking mails, orkuting we don’t want these types of toolbars. These toolbars consuming bandwidth, It will slowdown or internet. Not only this toolbars, its include add-ons, bookmark etc …. How do we compare the browser speeds..? Do you use any tool..? or just the manual comparison..? but how google, rediff, yahoo, toolbars updating the mail/friends status on their toolbar ? Albin, Thanks for sharing that plugin, Let me check the data out. Firebug is really useful.. right..? I just love it. Is there any way to blog images in firefox as we do in opera..? That could save lots of bandwidth. wow…i never knew about profiles for firefox until now….thanks matey. I mostly work in Linux. How can I create a FF profile on linux? Any ideas people?